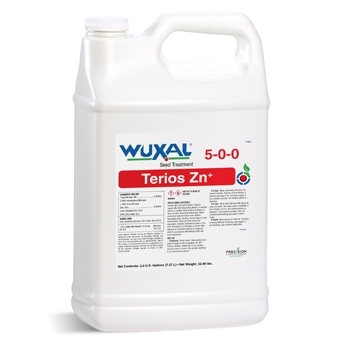 Wuxal Terios Zn+ is a nutrient suspension for seed treatment with special emphasis on zinc. The composition of Wuxal Terios Zn+ meets the specific requirements of cereals, especially for crops with higher zinc requirements like rice and corn, or when growing on soils with low zinc availability. Wuxal Terios Zn+ suspension creates an even distribution on the seed surface and sticks extraordinarily well on the the seeds. It can be used in combination with other seed treatments like fungicides and insecticides.